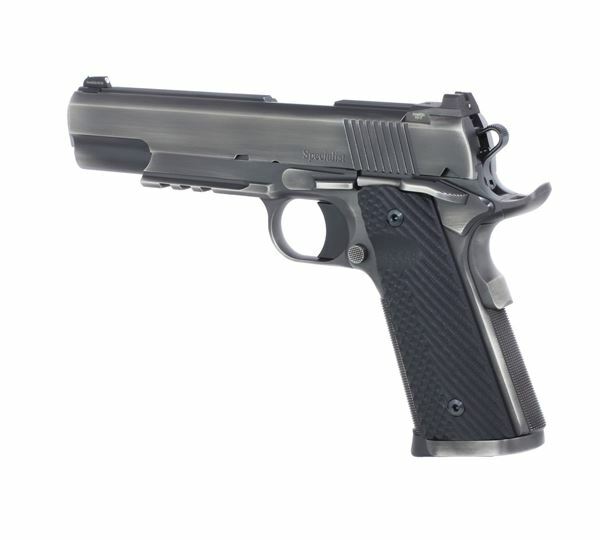 A full-size 1911, the Specialist Distressed is chambered in .45 and loaded with features to satisfy a public servant’s special requirements. The forged stainless steel slide wears our popular Clark-style serrated rib with a single amber tritium dot in the rear sight and a green lamp with white target ring in front. The Specialist ships with two 8-round magazines with bump pads and is available in our distressed Duty Black finish. The forged stainless steel slide wears our popular Clark-style serrated rib with a single amber tritium dot in the rear sight and a green lamp with white target ring in front. Available in Commander and full-size variants. Otherwise identical to the standard Specialist, this Distressed version has a hand-weathered frame and slide.